It's so important for children to dive into their reading lives and explore how they see themselves as readers. Share your reading life with your students. Have the students explore their reading lives. 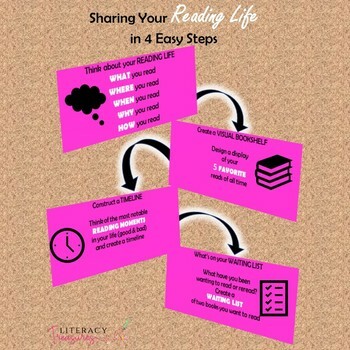 Use this printable as a guide to follow to share your reading life with students and for students to build their own reading lives. For more information read these post Building a Campus Wide Culture of Reading. As always, if you plan to share this product with other education professionals, additional licenses MUST be purchased for each individual using the product. Additional licenses are available for purchase on this product page. Any feedback you give regarding this product will be greatly appreciated. Please click the green star to follow me and to never miss when new products are added to my store. Please visit my literacy blog at www.LiteracyTreasures.com for tips, tricks and strategies to use within your literacy instruction.